Fall is in the forecast here, and I am very ready. I'm anticipating the rain and sweater weather that the weatherman predicts for this weekend. Texas weather is rather fickle, so I'll believe it when I see it, but I'm hopeful! In celebration of fall's arrival, I will be making one of my favorite 'Simmering Scents' for the stovetop- a mixture of dried oranges, cinnamon sticks, cloves, star anise, and bay leaves. I simmer mine in a cute little enamel pot that a dear friend sent me with her own 'simmering potpourri' one year. The photo above was made as 'traditional' potpourri, so I added in some essential oil of orange to make it more highly fragranced. I also added orris root powder to preserve the scent (which explains the dusty white powder on the side of the bowl, which did not make for a pretty picture, oh well....). 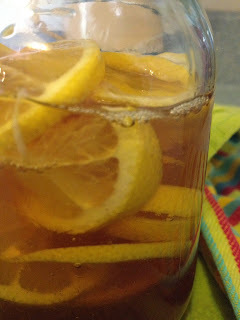 For a quick simmering scent- use peels of fresh oranges, lemons, and or apples, along with a few shakes of cinnamon or a cinnamon stick or two. I like to add in rosemary sprigs or mint sometimes in place of the cinnamon. Do you have a favorite simmering scent for fall? 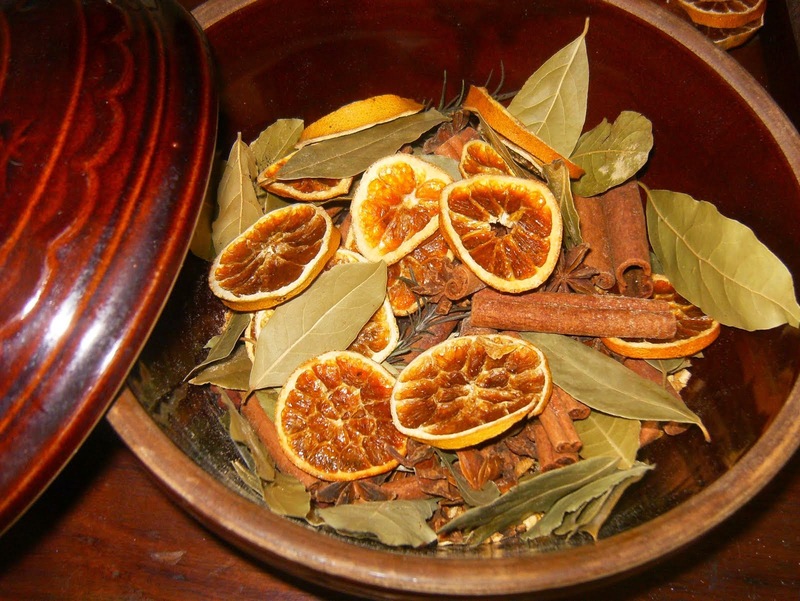 Do you make 'old fashioned' potpourri for display in bowls or jars? Please share your favorite way to bring a 'scent of the season' into your home! I love autumn, also. My gardens just weren't ready for the killing frost we had last night. I have most of my herb beds taken care of, but unfortunately, not my tomatoes or squash. I covered, but I think it just got too cold-25 degrees last night. Your potpourri recipe sounds comforting and simple for a cool day. Have you ever grown agrimony? Just looking for advice on the best way to use it. Sorry to hear about the frost. No worries about that for a while in my world. Heat does more damage than cold around here. I've never grown agrimony, it doesn't like our climate. My favorite herb resource, Southern Herb Growing, says agrimony has a traditon of use in tea blends and wines. It is also purported to be used as a tonic for skin, throat, and liver. Leaves, stems, and flowers yield a yellow dye. Hope that info. helps you- I'd love to hear how you decide to use it. The dye would be my option!